April snuck in like early spring blossoms, nearly tip-toed back out unnoticed, and then burst out of hibernation. 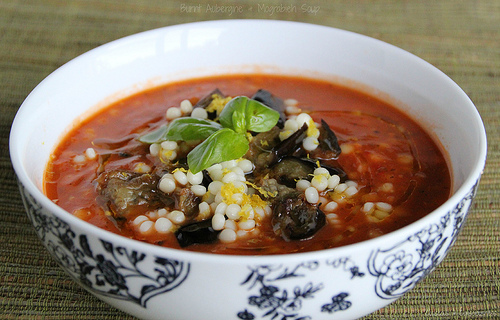 The couscous contest entries and burnt eggplant soup appeared all at once during the last week of the month. All the while, Jerusalem: A Cookbook won more accolades at the International Association of Culinary Professionals Awards – garnering both best International book and Cookbook of the Year. And the trend continued at the James Beard Awards on May 3 – where it walked away with Best International Cookbook. 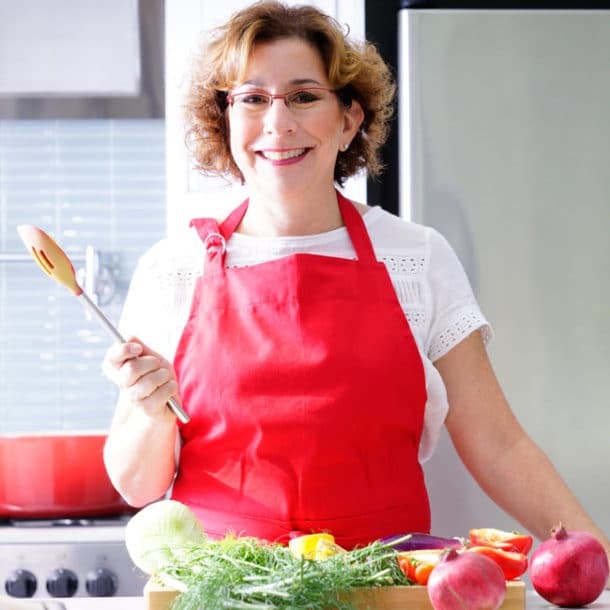 So in the spirit of giving out accolades – thanks so much to Hannah from Blue Kale Road, Michelle from Daily Waffle, Lana from Bibberche, and Amanda from What’s Cooking – Fine Dining My Way for entering Tasting Jerusalem’s first-ever recipe contest. 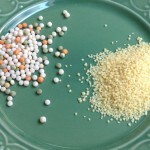 The contest invited readers to send an original or adapted couscous recipe. All four entries were wonderful, which made picking the winner very tough. 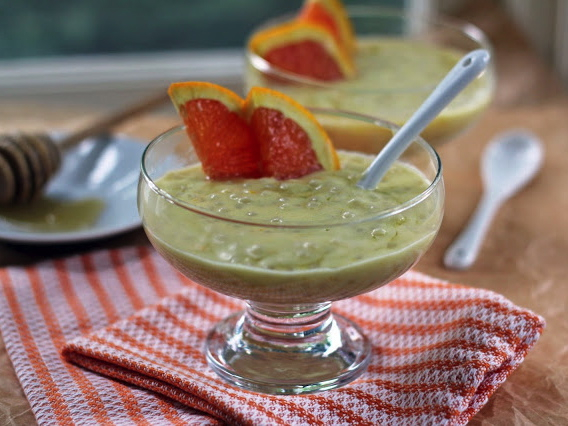 Ultimately, we chose Hannah for her break-from-tradition recipe, using the usually savory pearl in a dessert pudding. In case you missed any of the recipes, here is a photo of each dish and a link to their post and blog. Hannah won this jar of couscous from Sur La Table and the other entrants will be getting a thank you gift of Sadaf Baharat spice mix which will come in handy in future months of cooking. Michelle from the Daily Waffle, wrote this lovely story about her grandma and created this unique dish using roasted tomatoes for the vinaigrette – YUM! 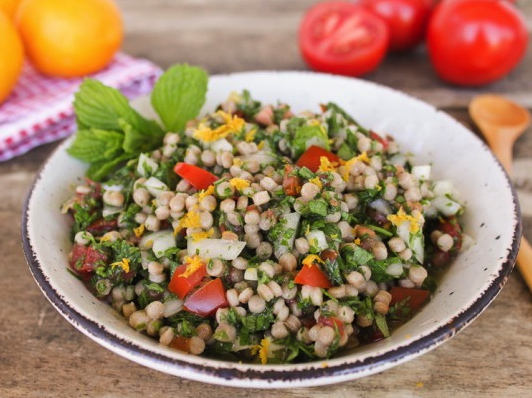 A few of us also made the Couscous with Tomato and Onion – a simple homey dish that would do beautifully with the addition of some green herbs or other spices. We found the instructions in the recipe calling for the browning of the crust at the end on LOW to need adjusting – the crisp crust required a jolt of heat at the end. 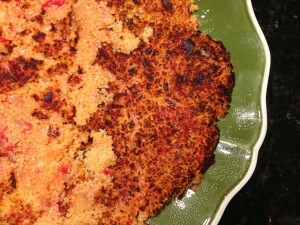 But it is a comforting dish, especially with the tomato taste that permeates the couscous. Worth a try for sure. 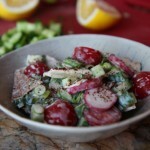 And one last shout out to Orly from the blog Yumivore – she made her own couscous at home – wow! Hope we see a blog post about that kitchen accomplishment! 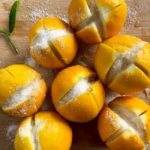 One last thing: June’s Tasting Jerusalem topic is preserved lemons. They take a month to cure, so we advise you to start now. If you cooked or wrote about a dish and we missed it in this round-up, please drop us a note in the comments below, the Facebook Page, or via email and we’ll add it in! Unlike April, May is here with a bit of a roar as many of us start to plan for upcoming celebrations – Mother’s Day, graduations, Father’s Day. So it seemed like the right time to bake! Pick any recipe from the baked items in the book, starting on page 258 – whatever tickles your fancy or fits your celebration best. And like last month, one of the recipes is available with a photo and recipe verbiage – the Spice Cookies! So if you know anyone who wants to cook with us but doesn’t have the book yet, send them this post and tell them to get started! See the end of the post for the recipe and you can grab the photo here or send me an email beth (at) omgyummy (dot) com. These are very loosely inspired by duvshanyot, or Pfeffernusse. 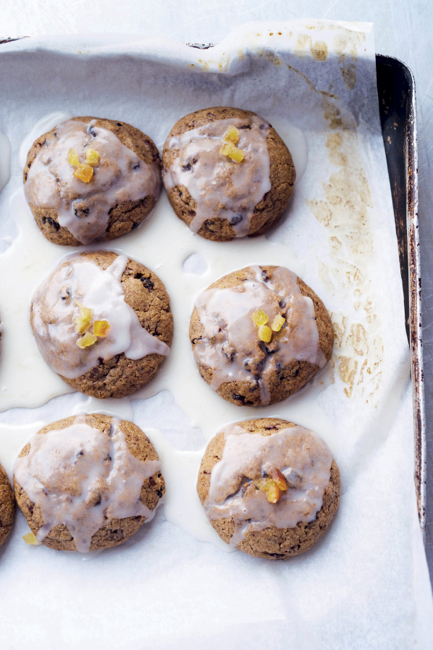 They are actually more closely related to an Italian spice cookie and are hugely popular on the sweet counter at Ottolenghi over Easter and Christmas. 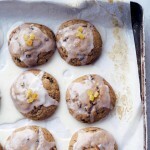 The recipe was adapted from the excellent "The International Cookie Cookbook" by Nancy Baggett." Soak the currants in the brandy for 10 minutes. Mix together the flour, cocoa powder, baking powder, baking soda, spices, salt, and dark chocolate. Mix well with a whisk. Put the butter, sugar, vanilla, and lemon and orange zest in a stand mixer fitted with the beater attachment and beat to combine but not aerate much, about 1 minute. With the mixer running, slowly add the egg and mix for about1 minute. Add the dry ingredients, followed by the currants and brandy. Mix until everything comes together. Gently knead the dough in the bowl with your hands until it comes together and is uniform. Divide the dough into 1¾-oz / 50g chunks and shape each chunk into a perfectly round ball. Place the balls on 1 or 2 baking sheets lined with parchment paper, spacing them about ¾ inch / 2 cm apart, and let rest in the fridge for at least 1 hour. Preheat the oven to 375°F / 190°C. Bake the cookies for 15 to 20 minutes, until the top firms up but the center is still slightly soft. Remove from the oven. Once the cookies are out of the oven, allow to cool for only 5 minutes, and then transfer to a wire rack. While the cookies are still warm, whisk together the glaze ingredients until a thin and smooth icing forms. Pour 1 tablespoon of the glaze over each biscuit, leaving it to drip and coat the biscuit with a very thin, almost transparent film. Finish each with 3 pieces of candied peel placed at the center. Leave to set and serve, or store in an airtight container for a day or two. You did a great round-up of all those delicious couscous recipes, Beth – I’m really looking forward to seeing all the May baking recipes. I found out about this cooking group from West of the Loop. Is it open for anyone to participate in monthly? 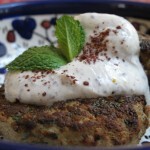 I would really love to be a part of the group – Jerusalem is one of my very favorite cookbooks! Come on down Amanda! Everyone is welcome. We communicate on this blog, on our FB page (Tasting Jerusalem), the hashtag #TastingJrslm, and now on a google group also called Tasting Jerusalem. Jump in anytime, join the conversation and the cooking! 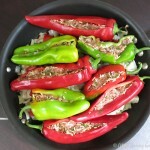 I LOVE LOVE LOVE what you are doing and the Hungry Goddess is jumping into the yummy fray! Plenty is my favorite cookbook but I am loving Jerusalem and looking forward to baking this month! So glad to have you Kim! You’re blog’s content and energy are fantastic and can’t wait to see how that adds to the cooking and conversation on Tasting Jerusalem. Plenty is an amazing book and the layering of flavors in Jerusalem, as you said, is just nothing short of magical. Welcome, welcome, welcome! Wow. 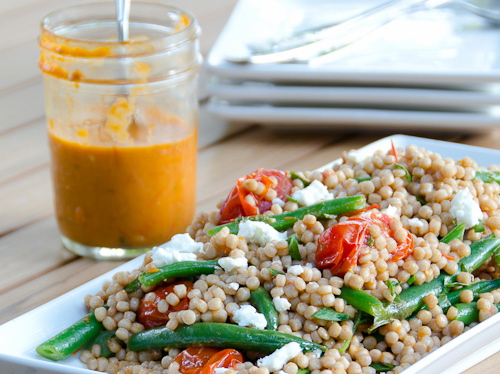 Those couscous inspired recipes all look so good! I want to taste test them all! Thanks for stopping by Jennifer! Glad they are making you hungry! Wow, I love all the cooking that went on in April! First of all, I’m so impressed that Orly made her own couscous. It must be heavenly! And thank you again to you and Sarene for hosting the contest. I’m honored to have won, especially given the other lovely, inspired couscous recipes – I can’t wait to try them all! 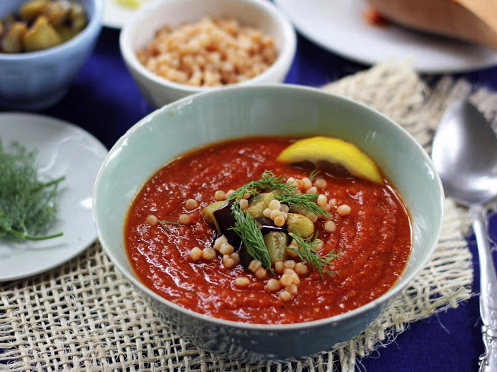 It was an interesting but fascinating month – so much happened right at the end but it was so inspired – the roasted tomato vinaigrette, your dessert, the homemade couscous and all that eggplant!! And I’m excited about this month too – I really want to make the krantz cake/babka – just hoping for a slow enough day to get it done! Thanks Orly! Let us know when the post is up – we will promote it and add it to this post. Such a great way to end the month with someone making couscous from scratch! Can’t wait to read about it. What an incredible round-up of couscous inspired recipes for Tasting Jerusalem that all look so appetizing. 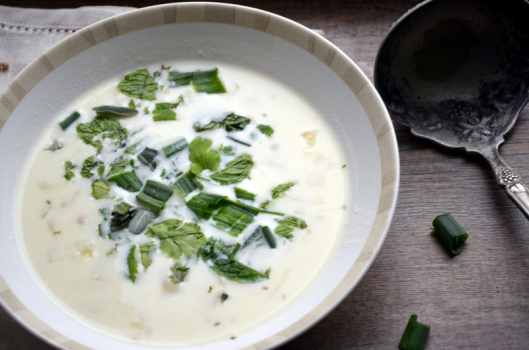 The yogurt soup (in the book) is such an interesting dish, tangy with incredible bite, creative use of couscous for this exercise! I haven’t tried the tomato and onion, but your notes inspired me to bump it up on the list. Many thanks for the shout-out Beth! 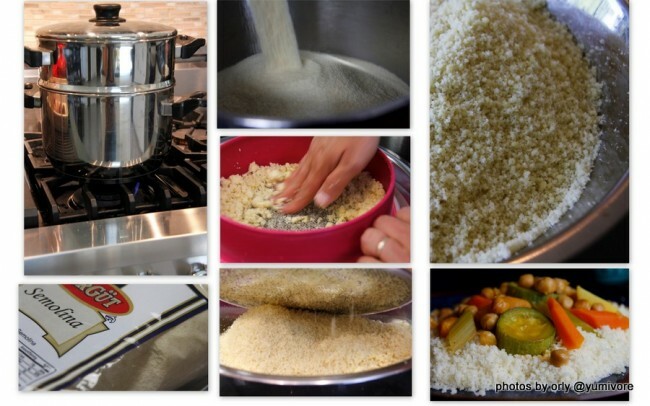 A post on making couscous by hand is in the works. Meanwhile, savoring this one. And to a sweet May!